When the audience enters the Shubert Theater for Verdi’s Macbeth, in the Boston Lyric Opera production that is playing through November 13, the first image to strike the eye is a broad swath of blood-red fabric draped across the lower half of the stage. Above it are visible nearly a dozen bodies, trussed up and hanging upside down. The immediate thought — at least for viewers of a certain age — is the end of Mussolini and his closest confederates, whose bodies were displayed in this fashion after their execution. The imagery of the Italian front seems to continue when Macbeth enters early in the first scene in a distinctly modern, rather military costume that might well suggest Il Duce again. To be sure, the production does not attempt to carry out World War II-era imagery consistently, but the opening image certainly evokes a dark, war-torn time. The production is based on a design borrowed from the New York City Opera, designed by John Conklin with lighting design by Robert Wierzel. It has been staged by director David Schweizer, who has divided the four acts (as originally played in Verdi’s time) into two by simply connecting the first two acts as Macbeth’s “Rise” and the last two as his “Fall.” This moves the action along effectively with but a single intermission. When I first read about the design element that involved the chorus so closely, I feared that having the chorus physically present when they are not “on stage” at any given time might confuse those who are not familiar with the opera. This worry comes from a recollection of seeing, over twenty years ago, a musically strong performance of Stravinsky’s Rake’s Progress by the opera department of the University of Michigan School of Music staged by the noted film director Robert Altman, in his very first experience of working on stage rather than film. Altman conceived the entire opera as taking place inside that mind of Tom Rakewell after he had been imprisoned as a madman in Bedlam. As a result, every scene — including the very opening in an sunny English garden with only three characters—was filled with choristers or supernumeraries in the rags of eighteenth-century insanity. In talking to other audience members, I learned that those who had never seen the opera before felt confused from beginning to end: Who was actually in the scene? Of course in film, it is the camera that directs the viewer’s eye where it needs to focus its attention. On the stage, an experienced director uses other means, because a viewer in the theater has the freedom to look anywhere. Grouping of characters, lighting, action, and so on all contribute to the effect of inducing the audience to see what the director wants them to see. David Schweizer took this potentially over-busy stage picture and unfolded the visual aspect of the story with reasonable clarity, especially the scenes between Macbeth and Banquo or Macbeth and his wife. Other motion going on behind them was most often in a more subdued light than that on the principal characters. Though there were moments of what seemed like unnecessary and irrelevant movement or some visual elements that were so thoroughly “theatrical” (like the giant puppet of the king, who has no singing role, that draws attention away from the human participants and cries out “here be symbolism”), the main characters played their scenes in effective ways. One aspect of this approach that seemed especially effective was the link between Banquo’s murder and the following banquet scene. The murdered Banquo collapses downstage, where he lies while the furniture for Macbeth’s banquet is moved on and the banquet itself begins upstage. When Macbeth learns that his order regarding the murder of his rival has succeeded, Lady Macbeth comments that he said he would come to the banquet — at which point Darren K. Stokes, the effective Banquo, rises and takes his place at the table, unseen by all but the terrified Macbeth. The two principal singers, Daniel Sutin as Macbeth and Carter Scott as Lady Macbeth, were making their Boston Lyric Opera debuts. Both seemed in less than ideal vocal condition at the beginning of the opening night performance, though they sang their way into their parts, both of which are notoriously challenging vocally, as the evening went on. Sutin’s Macbeth was appropriately noble at first, though dramatically he was pretty thoroughly under the control of his wife as long as she lived. Scott’s Lady Macbeth was, from the first moment, a determined, dominating woman until the sleepwalking scene, in which she was especially effective. Unfortunately, she was forced to carry a battery-operated fluorescent light bulb instead of a candle, which rather got in the way of attempts to cleanse the (imaginary) blood from her hands until someone mercifully took it from her. Richard Crawley as Macduff nailed his one aria, lamenting the fact that he had been unable to protect his children from Macbeth’s assassins, with a passionate Italianate color. 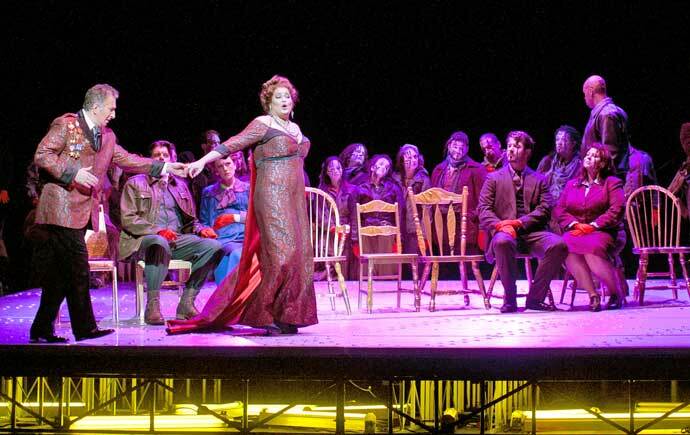 The Boston Lyric Opera Chorus had an unusually large role, not only in singing but also being part of the stage picture through so much of the evening. The central area where action took place was a tilted platform behind which grids soared and sank. Around the platform at a lower level the chorus could move or ascend the platform from any side. Two essential scenes employ the women of the chorus as Shakespeare’s witches (Verdi made them three choruses of six singers each rather than three individual witches); and the mixed chorus sang with great warmth one of the noblest passages in the entire score, the chorus of refugees making their way about of Macbeth’s tyrannical kingdom. 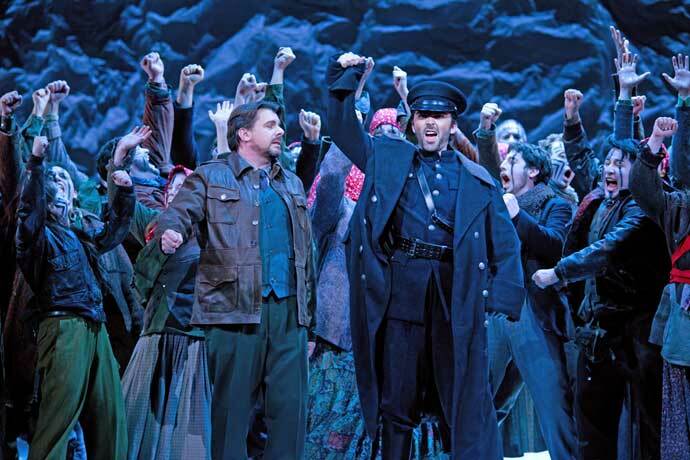 David Angus led the Boston Lyric Opera Orchestra superbly, shaping the energy and flow of Verdi’s first Shakespearean opera, with energy, color, and drive. This review mollified my initial reaction to the staging. At the outset, the chorus seemed to be zombies, not witches, and the zombie look persisted, although the zombie movements decreased. In line with the WWII theme, having King Duncan need crutches to walk immediately evoked FDR (which gives rise to speculation about whether Malcolm is Wallace or Truman). I liked Lady Macbeth’s dancing during the banquet scene and the way she and Macbeth stepped over Banquo’s body. I also liked the touch of having Fleance in front at the end handling and finally wearing the crown that will go to his descendants. In general, though, I left the theater feeling that if someone established a Foundation to Encourage Concert or Semi-Staged Performances of Opera, I’d contribute. But musically I thought it was pretty good, even if we didn’t have Leonard Warren and Leonie Rysanek. I wouldn’t mind hearing this Macbeth performance again. And visually, on second thought I have to agree with Mr. Ledbetter that it could have been worse — it was actually tolerable. As Eurotrash productions go, this one was mostly convincing. None of the staging really got in the way; the chorus – zombies, witches, whatever – acquitted themselves admirably whether singing, acting, or moving props; and the band was perfectly fine. Banquo was excellent, MacDuff even better. But at the core of the work were two performers who could neither sing nor act their roles convincingly, at least for me. Lady M’s shrill top and often inaudible lower registers did nothing to make the evening thrilling; Macbeth’s voice, while not offensive, was not up to the task. We could have lived without the fluorescent bulb and gotten a lot more drama with a little “damned spot” removal. All told, a decent evening of theatre/opera, but for the gaping hole in the center of the plot. Too bad – there have to be singers better suited to this piece. This review and the comments are far too kind to a production that worked against the music. Two simple examples: during the chorus of refugees, Duncan in a blindingly white suit spattered with brilliant red blood wandered the stage touching hands with random members of the chorus. Banquo staying onstage after his murder, as mentioned above — that works until Lady Macbeth has to step over his body more than once before his rises. I note as well that the surtitles did not provide us with the text as sung. One exampel among many: for the procession of the murdered that Macbeth reports — a third! a fourth! — Macbeth’s words were edited in the surtitles so that his progressive amazement was lost. I know just enough Italian to know that I’m not being given the text as sung. Readability and timing may require compromises, but in this Macbeth I think we were not well served. I do think the musical cuts worked very well. I have only seen Macbeth once before, at Covent Garden with Hampson and Urmana. That was an occasion for great singing, but the evening dragged. The speed of the BLO production was terrific. The drama hurled forward. Given how Carter Scott was struggling, that was a very good thing.